Good morning! Today will be a quickie post as I need to be out the door soon... 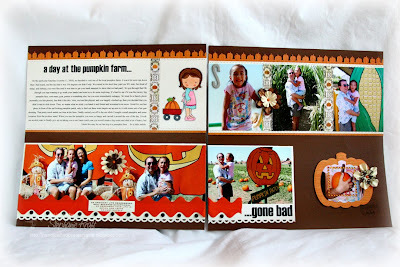 I'm back with a double layout from our recent visit to a pumpkin farm. While making the Pumpkin Emma card yesterday, I decided to stamp off and color two images and used the second one here on my layout. The title reads "a day at the pumpkin farm... gone bad". I think that pretty much says it all! 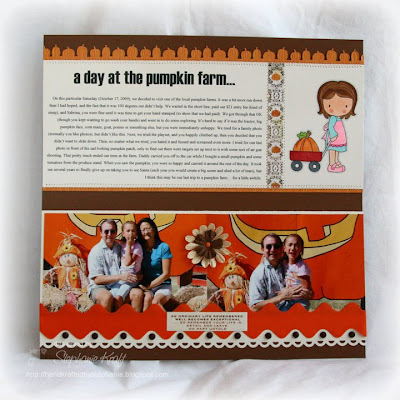 "On this particular Saturday (October 17, 2009), we decided to visit one of the local pumpkin farms. It was a bit more run down than I had hoped, and the fact that it was 100 degrees out didn’t help. We waited in the short line, paid our $21 entry fee (kind of steep), and Sabrina, you were fine until it was time to get your hand stamped (to show that we had paid). We got through that OK (though you kept wanting to go wash your hands) and went in to do some exploring. It’s hard to say if it was the tractor, big pumpkin face, corn maze, goat, ponies or something else, but you were immediately unhappy. We tried for a family photo (normally you like photos), but didn’t like this. Next, we tried the playset, and you happily climbed up, then you decided that you didn’t want to slide down. Then, no matter what we tried, you hated it and fussed and screamed even more. I tried for one last photo in front of the sad looking pumpkin patch, only to find out there were targets set up next to it with some sort of air gun shooting. That pretty much ended our time at the farm. Daddy carried you off to the car while I bought a small pumpkin and some tomatoes from the produce stand. When you saw the pumpkin, you were so happy and carried it around the rest of the day. It took me several years to finally give up on taking you to see Santa (each year you would create a big scene and shed a lot of tears), but I think this may be our last trip to a pumpkin farm… for a little awhile." 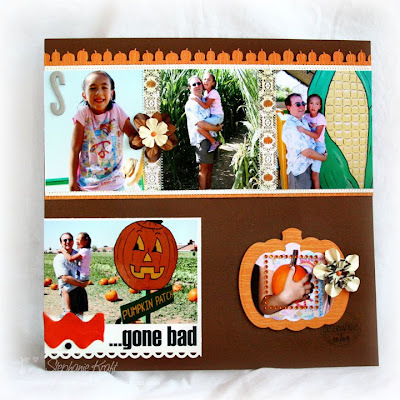 You can get your Pumpkin Emma stamp and many other scrapbook/stamping related items from The Scrapbooking Cottage. Accessories: Pumpkin Nestabilities (Spellbinders), Pumpkin border punch (Martha Stewart), Apron Lace border punch (Fiskars), Markers (Copic), Flowers (Prima), Ric Rac Grosgrain (May Arts), Candy Dots (Pebbles), Rhinestone square (Heidi Swapp), "S" chipboard (American Crafts), Brads, Foam tape, Thread, Sewing machine. Such a lovely layout and Emma goes so perfectly with it. Sorry Sabrina didn't enjoy it too much. But wow, that's still some hot weather!